Imagine having the lively, vivid colors of a tropical garden no matter where you live! 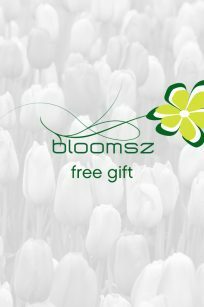 The Bloomsz Tropical Gladiolus Bulb Mixture provides stunningly brilliant reds, yellows, and purples that all lovers of Gladiolus want. Tall and stately, these colorful hues add drama to the back of borders and beds. Tuck a single flower into a bouquet, use single or multiple flowers for a corsage, or group full stems to create vibrant cut-flower arrangements. Select an area in the garden, a bed, or border that receives full sun and where the soil is sandy, well-drained, and rich in organic matter. Gladiolus planted in straight rows tend to look like soldiers, which is perfect for a cutting garden. However, for a more natural look they should be planted in holes that are round or oval shaped. Dig a hole 8” deep and add bulb-boosting fertilizer following the directions on the package. Compost may be added to enrich the soil if needed. Cover the fertilizer/compost with 2” of soil and place the bulbs with the pointy end facing up 6” apart. 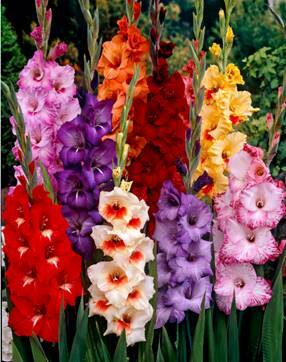 Gladiolus look best when 10-12 bulbs are planted in the same area. Cover the bulbs with the remaining soil and water well. Cover the area with 2” of mulch to keep the bulbs cool. Gladiolus bloom 70-100 days after planting. To enjoy flowering throughout the season, plant bulbs 2 weeks apart. 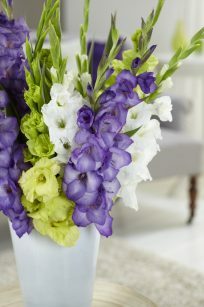 Lovers of Gladiolus know that they make excellent cut flowers. Tall and stately, our Bloomsz Gladiolus Gemstones of the Garden Bulb Blend features some of the largest flowers in true gemstone shades. The lime green of peridot, the opalescent white of freshly fallen snow, and the bluish-purple of amethyst delight the eye both outdoors and inside the home. Grow these beauties in your cutting garden or add them to the back of borders and beds where they’ll sparkle like precious gems in the sunlight.